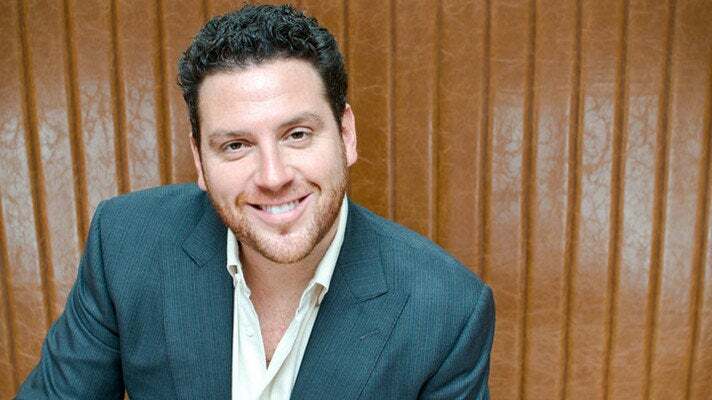 Scott Conant has earned accolades for Scarpetta, which opened at the Montage Beverly Hills in October 2010. This isn’t the first restaurant for the Connecticut native, who has a small, growing collection. It all started in New York, the city Conant and his family call home. But expect to see a lot of the affable chef here. Turns out Los Angeles agrees with this New Yorker. Is anyone in your family in this business? No one. My father grew up on a farm. My mother’s family is Italian American. My grandfather had a garden in the backyard. So it started at a young age, the love of food. Plus I was a chubby kid. I try, especially when I am not opening a restaurant. I try to eat vegetarian three days a week. And I try to stay away from big protein. If I eat protein, I try to do tofu. I try to be very disciplined. I read that you started taking cooking classes at 11. I started working in kitchens at 15 and cooking a lot at home at 11. I liked it immediately. I played a lot of sports as a kid. The camaraderie I found in the kitchen was similar. And why Beverly Hills for this Scarpetta? I’ve always dreamed of opening a restaurant in LA. From a marketing standpoint, it’s a huge market. To have the bookends of the country—I have an apartment here so I spend a lot of time back and forth. Are you like many New Yorkers, who think that New York is a superior restaurant town? I think LA gets a really bad rap. If you focus on the best elements, the small ethnic restaurants, it’s spectacular. But that’s not what Scarpetta is. The name [which means “little shoe”] lends itself to being soulful. It has a rustic element. It’s a good sized restaurant in the Montage, my fourth Scarpetta. This doesn’t mean you can’t take an old world value approach to things. How did the relationship with the Montage come about? The owner of the hotel came into New York and enjoyed his experience and thought maybe we could do something. Did you want to be in a hotel? I was weighing my options. It made the most sense to be inside a hotel. New York is a different hotel culture. People in LA go to hotels a lot more and hang out at hotels. The long and short of it is, we still wanted to create an independent spirit. I didn’t want to be a hotel restaurant. I wanted to be a restaurant in a hotel. No one wants to be a ‘hotel restaurant’ these days. When did hotel restaurants get such a bad reputation? It’s changed a lot of over the years. When Bellagio started doing these deals, I think the idea of a hotel restaurant started to evolve a little bit. As long as they evolve that independent spirit, there are a lot of benefits from being in a hotel. The potential for getting a little too corporate is the fear. How often are you in Los Angeles? I have a lot of restaurants. I’m committed to all of them. I have apartments in Las Vegas and Los Angeles and Miami [in addition to New York]. I go where it’s necessary, where the most attention needs to be. Do you like bopping around from one restaurant to another? I wouldn’t do it if I didn’t love it. A lot of chefs expand in one city but you decided to conquer the entire country and beyond [Toronto]. Why this route? Fortunately we’ve had great success so far. The intention of growth is to open restaurants in alpha cities. Chefs have said the bigger their businesses get, the less time they spend in the kitchen. I spend sixteen hours a day in the kitchen inside the restaurant. If I’m in a city where I have a restaurant, I’m inside the kitchen. I have a laptop in the kitchen. I spend a lot of time cooking. I spend time developing new recipes and I have a staff that develops new recipes. I think everybody opens a business for different reasons. The more we grow and expand, the more I like to get back to the simple elements of things. I put a huge amount of trust in my staff. I set up everybody up for success. You sound like a dream boss. Do people stay with you a long time? We have a staff that’s been pretty loyal so far. A lot of the staff in New York has been with me for years. The pasta maker’s been with me for over twenty years. I’m a big believer in creating a like culture inside the restaurant. If they are hired to do a job, they have to understand the soulful elements, the mentality that goes into creating these things. Happy cooks make happy food. It’s all about customer happiness. What do you mean by “understand the soulful elements”? When people are passionate about what they do, they understand the depth of it. Does this extend to, for example, the busboys? Everybody listens to those speeches. Now whether or not they resonate with someone is another thing. I spend a lot of time with my staff. We’re in this together. It’s my company and I’m a chef, but at the end of the day it has to be first and foremost a hospitality company. This doesn’t sound like what a lot of restaurateurs are espousing these days which is more like, “Have it our way.” No substitutions and all that. I always say we’ll do what we can. We’ll make changes as long as it doesn’t affect the integrity of the restaurants. Our intention is to make the customer happier. I’ve learned over the years to be very appreciative of customers. I think customer appreciation goes a long way. You need to be. If you start treating them like your enemy, they won’t be there anymore. What were your preconceptions about Los Angeles dining? The biggest fear is always an outside chef coming into a different market. There’s always the fear of backlash. I have no expectations. I take a very humbling approach. I have no expectations of people appreciating me just because I’ve arrived here. There are a lot of people who aren’t going to like a New York chef coming here. I don’t compare myself to anyone. We do what we do. Hopefully it will resonate with people. It’s a big market. Everybody can survive and not take away from anyone else. I’m a big believer in the rising tide raising all ships. I know you tweak your menus depending on the market. What steps did you take for the LA diner? I always have a vegetarian menu available. It’s not some tiny piece of paper with five things. There are a lot of options. It’s about being inclusive and making people feel comfortable. There’s no reason people can’t be as passionate about a sunchoke as a piece of duck. Do you ever feel like you are your spaghetti? What can people do to step up their home spaghetti? I’m a big proponent of using fresh tomatoes. Why I don’t like canned tomatoes is they’re still in preservatives. I can’t get past that flavor. There’s a synthetic element. Canned are good to stretch things out a little bit. But you always need to use less canned than fresh. If I can’t get great tomatoes, I’ll add a can to stretch it along. Otherwise, the only place I use them is in reductions. Do your chefs get to strut their stuff at all? There are a lot of core items I have on every restaurant menu: signature dishes I would be crazy to take off the menu. What I tell them is, within the confines of who we are, you can do whatever it is. I’m firm but fair. Right now we’re a small enough company we can control it pretty well. At the end of the day it’s concepts. Scarpetta is a concept and it’s fluid. It’s not about me. But it is my vision. I always say the restaurant will dictate and evolve what it will become by the clientele. Standing on principle gets us nowhere. Many chefs aren’t so hot on Yelp. But at a glance, Yelp appears to be very good to you. Reviews are glowing in fact. I don’t read that stuff. We talk to customers a lot. I understand some chefs’ reservations. It could be a competitor who doesn’t like you. It could be an ex-girlfriend. I don’t read that or if I do, I think, what can we learn? Ultimately it’s about how we can make ourselves better. It’s not about me. It’s about how everyone can get better. Really it’s just about creating a better life for yourself. I’ve been in situations where I was unhappy. It’s why I started my own business. I always wanted to treat people how I wasn’t treated when I was a young chef. I want to hear the ideas of the staff. I know it sounds like BS. But it’s true. And I listen to a lot of Dylan. You are very well established. Along the way did you ever hear doubts from people about being an American kid doing Italian food. Ah, the authentic question. Yeah early in my career I got stuff like that. I don’t engage in stuff like that. What do you think of LA? I gotta tell you: I love it. For some it’s the perfect life, living between New York and LA. I’m easy going enough that LA suits me, but not easy going enough that I need to be in New York a bit because I still have that edge. Most importantly, my wife likes it here. And you know what they say: happy wife, happy life. Do you have time to check out LA restaurants? Not as much as I would like to. I have to tell you, and I’ve never been a guy who likes steakhouses, when I went to CUT, it blew my mind. It’s truly a steakhouse from a chef’s perspective. I went to a place called Park Sushi, a place called Honey Pig. It’s Korean barbecue. Unbelievable. I went to Animal. Those guys are awesome.